It started when I was asked by a friend to suggest a use for the OO layout he'd started building with his grandson, but never finished. The 6' x 4' baseboard hinged down from the garage wall; there was a Hornby 'trackmat' design, with all of the appropriate track. My immediate thought was of a large-scale narrow gauge, and Gn15 in particular, as my friend had dabbled in G scale some years before. Sample layouts were drawn up and scenarios created. However, very soon, the idea of building my own Gn15 layout took root, and grew! This first foray was going to be small and a spare piece of 6mm ply was measured-up - 1090 x 176mm - a shelf layout. But what could I achieve? The first thing was to research what was already around. I'd seen several layouts at shows, principally Expo NG at Swanley. I found the Pepper 7 website, and the Waterley Bank Estate Railway (something 'after my own heart', having built an O-9 layout in the past). The latter inspired a farm-based layout, with a feed to a single point and two sidings. This should allow testing of most aspects. I had a mixed bag of track thrown out by a neighbour and put some together. Almost immediately, another point and siding was added to 'fill the space'. In parallel to the layout, I considered the scale I was to use. I was already working on a small SM32 layout and realised that 16.5mm track in 16mm/ft scale was approximately 12" gauge (actually 12.375"). It made sense, as I could use items for both layouts. 12" and 12-1/4" railways existed in various industrial locations, and still exist as pleasure lines today. A friend told me about a prototype 12" gauge railway at a brewery and if it were not for the thought of making lots of barrels, I might have gone for it. However, an engineering warehouse eventually emerged, which offered a variety of wagon loads, and was very appealing. This idea also meant that the layout would be the inside of the building and the fiddleyard, the space outside - again, something that appealed to me. ​I started to plan the building using 16mm/ft (1:19) and was quite happy. I re-gauged a couple of 'Binnie' skip wagons and used them for clearances. 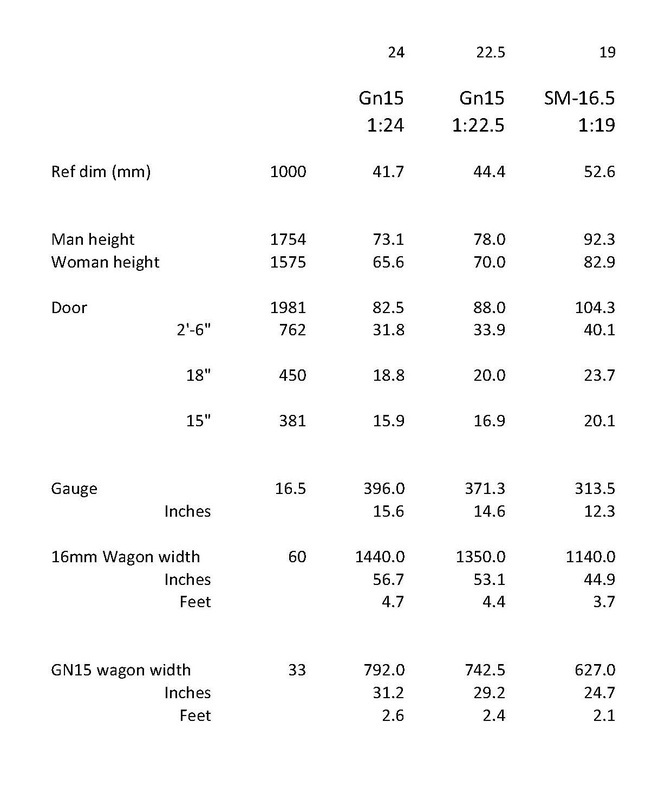 However, everything looked a bit tighter than I felt was comfortable, so I decided to investigate the difference between 16mm scale and both of the Gn15 scales (Fig 1). I was a little surprised to note the difference it actually made. My skip wagons were 60mm wide whereas the Sidelines wagons were 33mm wide. Some of this variance was down to the scales, but probably more to the instability of the narrower 15" gauge compared to the 2ft gauge. I decided on 15" gauge, but which scale - 1:22.5 or 1:24? The difference in gauge was nominal (14.6" or 15.6"). Then another friend advised that 1:22.5 was more popular in Europe, so that was it. I produced a quick-reference sheet to enable me to redesign the key elements (Fig 2). This seemed to work quite nicely, so it was back to the drawing board! 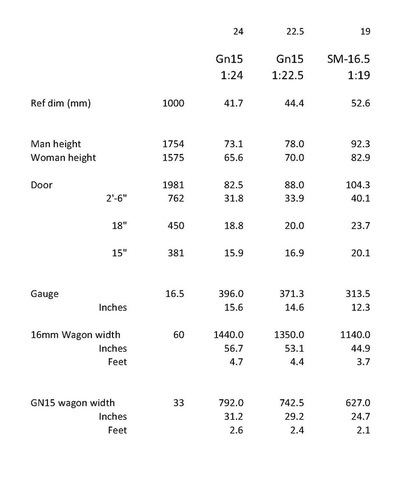 Subsequent to these investigations, I was 'educated' about the misuse of the term Gn15 and how a variety of scales and gauges were being modelled on 16.5mm track all labelled as Gn15 - even 18" gauge! Furthermore, there are meetings at high-levels in the modelling authorities, taking place to standardise the naming of the variations. This being the case, a scale/gauge descriptor was suggested to be the much safer option. However, I believe, that my layout does comply with the principle of the label, so Gn15 it remains, for the time being!